The Honourable Margaret Norrie McCain was born October 1, 1934, in northern Quebec. Her father was a prominent mining engineer in the early days of the Quebec gold mining industry and her mother was Senator Margaret Norrie of Truro, N.S. Mrs. McCain received her early education in public and private schools in Quebec, Nova Scotia and Ontario. She received a Bachelor of Arts degree with Honors in History from Mount Allison University, Sackville, N.B., and a Bachelor of Social Work from the University of Toronto. She has been presented with Honorary Degrees from a number of prominent Canadian universities. (see below). Throughout her career, Mrs. McCain has been active in organizations that promote education, music and the arts at the provincial and national levels. She was a member of the Mount Allison University Board of Regents from 1974-1994 and served as Chancellor of the University from 1986-1994. She is a founding member of the Muriel McQueen Fergusson Foundation in New Brunswick which is devoted to the elimination of family violence through public education and research. Mrs. McCain chaired its capital campaign to endow a Family Violence Research Centre in partnership with the University of New Brunswick. In 1955 she married entrepreneur G. Wallace F. McCain of Florenceville, N.B. who died in 2011. They have four children and nine grandchildren. On April 28, 1994, Margaret Norrie McCain was appointed Lieutenant-Governor of the Province of New Brunswick - the first female to hold this position. She served in that role until April, 1997. At that time she moved to Toronto to re-join her family. 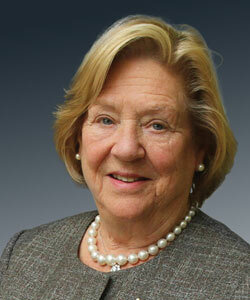 Margaret McCain also serves on the Board of the Canadian Women’s Foundation and the Canadian Institute for Child Study. In April 1998 Mrs. McCain was appointed by the Secretariat for Children, Province of Ontario, co-chair of the “Early Years Study.” In 2002 she co-chaired a Commission on Early Learning and Child Development for the City of Toronto. She has participated in numerous early child development policy and programme initiatives in Canada and is frequently asked to speak at conferences, seminars and meetings across the country.